The main activity today was the combined efforts of Mick and Charles to assemble small track components for ongoing work at Shottle. Three cheers for Charles who was the lone respondent to Mick's pleas for help. Their activities will minimise lost time through the week. The Booking Hall and Buffet Car received a small range of visitors on what turned out to be a most pleasant day after the monsoons of the weekend. Let us hope the second Bank Holiday weekend of the year yields conditions more conducive to earnings that relate to the effort put into them. 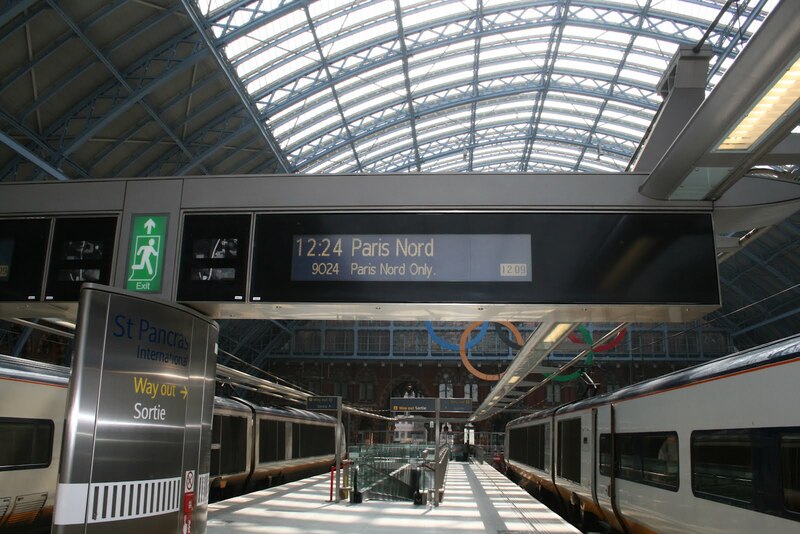 a delay of nearly twenty minutes was experienced to the down service. several occasions to fix dicky wipers on the service train. furniture are now drying out in front of Rodney's fire. Distant: pending inspection of the railings and parapet of bridge DJW 12. Today was an earning day as we entertained four Drive a Diesel Day participants and 3 Steam Experience guests. They were very ably entertained by John Allsop and Richard Buckby on D8001 and Mick Thomas and Neil Hardwick on No3. These "experience days" bring a great deal of good will to the Railway and I don't think we have had a disappointed customer since we started down this road. Opportunity was taken to take two vehicles to Shottle for next week's endeavours with the diesel experience but the plan to take the three loaded Dogfish was somewhat frustrated by a vacuum brake problem. The Pullman Buffet Car fed our guests and gathered some trade from their partners and girl friends. The Booking Hall ensured all were welcomed and pressed on with a multitude of tasks to ensure we are ready for the upcoming weekend. Thanks also are due to John Evans who acted as guard for the morning steam experience and afternoon diesel experience. The demand for these products remains unabated and they have become a crucial part of our growing enterprise. There was a side product from all this activity as the progress along the line checked its condition after days and days of heavy rain revealing no particular concerns - at the moment! The continuation of the most unpleasant weather would dampen all but the most hardy souls. However, today's attendees demonstrated true grit as they advanced the cause of our enterprise. (should be able to enter an appropriate sound clip at this stage). The PWT dealt with a "twist" in the track at Platform 2 at Wirksworth detected by the track recording trolley and also fettled the ballast on the Incline affected by the activities of the Railvac machine. The Incline also benefited from a track patrol and some order was restored to the Tool Van. I omitted to mention the track patrol from Duffield to Idridgehay yesterday that also were drenched in the process. The dmu team descended in force as they prepared the service train for the weekend. A leaking roof in the centre car was fixed and 51505 had final mechanical attention prior to its return it service. Fuelling also took place for the weekend which always causes me to twitch but they were relatively modest in their demands. VCT continued to attend to the fencing at Hazelwood station with Hingleys supplying the materials and generally advising and guiding on the standard of finish. A tree was felled at the south end of their patch to ensure the fenceline was perfect. The DTT reported that on Tuesday their team grew to four and accomplished much painting and plumbing followed up today by further interior painting. When the painting has been completed the last part of the task is to tile the floors. I think it is fair to say we will have the finest toilets in Derbyshire within a few days further work. The Booking Hall and Buffet Car plied their trade to a small audience today. My congratulations go out to every one who has continued with our project this week in the most unpleasant conditions. PS On my return from Glasgow Tuesday I travelled Glasgow to Birmingham and then joined a Cross Country service from Birmingham to Derby encountering an old friend, "Virgin Dave", now "Cross Country Dave". An early painter of all our mileposts and Gatwick Express bogies. It reminded me that today's drivers wear smart suits and are definitely kings of the road, deservedly so given the responsibility for several hundred people.Nonetheless, Dave will be back amongst us before long and at least will "whistle up" as he hares through Duffield. The most miserable day of the year celebrated my return to the fold after visiting La Belle France and the latent separate country of Scotland. Day two of our customer's quest for certification endend successfully with a return trip to Duffield. As the machine was driven from a basket the operator was not just wet but soaking. Just think Onedin Line. Our Idridgehay to Wirksworth track patrol were equally wet after their brave efforts and found our drainage struggling to cope with the continuous downpour. The likelihood of an hosepipe ban must have considerably retreated. The Lone Carriage Cleaner tackled 51505 after its fitting of splendid new seats. 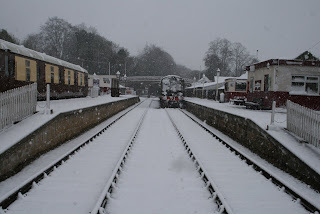 The Booking Hall and Buffet Car were open for business but few brave souls took advantage of this opportunity. To cheer me up, and perhaps you, I attach a photo of Britain's favourite station. We have introduced a new version of the webcam page. This should make them easier to view as flicker is reduced and the menu bar will move for people with smaller screens, meaning more image will fit on the page. If you have trouble seeing the cameras, please clear your temporary Internet files and refresh the page. Internet Explorer or Apple Safari. We are aware that occasionally you may just get a blank image and a fix is on its way in due course (it says here). View them at http://www.e-v-r.com/webcams/ . ably stood by their posts this afternoon. spread as far as the East of England. clearing and fencing the line and the improvement is indeed most obvious. paperwork, this is of necessity. Before we get to today's happenings I have been overwhelmed by your generosity with no less than £2750 pledged towards our rail bender after just 24 hrs. Now the bad news - the price is £4880 plus very awful tax. I have today spoken with Geismar and that is off the shelf price so maybe we can better that a bit with a bit of grovelling. We will continue for a couple of weeks to see if we can raise this amount. Of course the company will pay the vat and you can pay the money into the company in the form of a share application so you get shares for your contribution. On this note it's worth reminding you that if you buy £500 worth of shares or more then you are entitled to a refund of your income tax of %20 of the value under the current scheme so you would receive a rebate of £100 on your purchase - the minimum amount to qualify is £500. Some of you have already sent money to the company but it might be best to just pledge an amount until such time we are sure we have enough to purchase the equipment. Again many thanks and we will see where we get to. Today we had Korec on site testing their equipment with driver training on the class 33 with Hylton and Richard passing out to drive said machine. P way were out and about in the yard weed killing and I toddled off to Worksop to obtain some special fishplates for the Shottle project from our friendly track dealers. The center car or centre car from the 3 car set had more attention to it's roof from Mike with Martin absent in the land of whiskey on official business,more red gold was delivered ( diesel ) and further attentions were made to the station buffet to complete the renovation. A busy day. We will shortly be ordering badges for staff with public duties (i.e. having a rally and visiting us in the process. apart, from the occasional work report in these annals. I leave you now for an urgent appointment at the Shanghai Emporium. A very pleasant day with lots of activity on the railway with shareholders in abundance. Our normal timetabled service ran with the usual efficiency and the better weather impacted positively upon our passenger numbers. A small army of conscripts tackled the mess room, cleaned a number of DMU bogies, cleaned the toilets and the cribs were filled with ash ballast all with good results. Work continued on the LMS break van and a small number of the 8F group continued the boiler restoration work, The DMU team had a successful day fitting the re upholstered seats in 51505. The two Pullman coaches were bolted together and heat and light was reinstated to the second class coach . The Class 20 group members set about a vacuum fault which was successfully resolved to the joy of all concerned. Tonight's evening charter was a most enjoyable affair and returned to Wirksworth ECS at 22.30 making it a long day for all concerned. A quiet day at base with monsoon rains most of the day. It was very quiet at Wirksworth but the LCC managed to get up to date on the spring cleaning of the coaches, finishing off with the Pullman First Class coach. The Pullman Buffet still had some hardy souls which is promising considering the weather. Undeterred, the PWay team were battling the elements at Shottle continuing with the installation of the pointwork for the loop. This is most appreciated as they are working hard to reconnect our railway together ready for passenger trains at the weekend. They are very wet! As I write, the sun has come out! Typical! hue and cry down the main line, thankfully not our main line. proceeded to leak in the usual way as soon as the tanks were filled. buffet we were offered 500 teddy bears. of the way along it. been re-attached to the flag pole. Despite a weather forcast predicting gloom and rain a very pleasant day with PWT progressing well with the blockade at Shottle. Plain line has been removed, the ballast dug out and 38 crossing timbers unloaded ready for laying out tommorow. All chairs and smalls have also been unloaded next to the work site. The weather doesn't bode well for the morrow but we shall see. Enquiries for a further 3 days of testing work means our already busy railway is bursting at the seams with not enough days in the week to satisfy all our different business interests with driver experience days, testing work, passenger services, charter work midweek and days for repairs all clamouring for a place on the calender.This week and next are booked solid - no more room at the Inn. the buffet's supplies of bacon and brie paninis. tidying up of the Swedish Piles took place in the car park. first coat of paint to the interior of the South Weighbridge. it falls to yours truly to report on today's Wonderment of Wirksworth. major way, ably hosted by a fine array of our enginemen. passer-by asked, looking at one of our Phil Tarry branded money boxes. general entertainment of assorted visitors who came between showers. bay seats to the frames. The great event of the day was welcoming our second visit from UK Railtours that involved a large number of our team providing a range of facilities. A slight bottom clenching moment as the three car set wouldn't maintain air pressure before departure to Duffield resolved in Graham's inimitable style that allowed the day to proceed seamlessly. Meanwhile No3 and brakevan together with Iris were readied along with the miniature railway, narrow gauge, evra shop, Company shop, Pullman Buffet Car and model railway. The whole event that attracted 137 people to Wirksworth was a most successful, profitable and pleasant day. My thanks go out to all our team who pitched in and made it happen not forgetting the two that ensured Gorsey Bank and Idridgehay gates were open for non stop runs between Wirksworth and Duffield and the on board trolley team that added that extra ingredient to the day. In the background a dmu team replaced a Guards window on the Class 108 and dealt with a leaking roof on the Class 119. The EVRA team achieved a connection between the water tank on the Incline and the newly positioned rail tank north of Cemetery Lane bridge. This will help us ensure water for our steam engines is much more accessible and stress free. The VCT were constrained by today's trains but achieved the required fencing at Duffield for the disabled toilet access. Another day that showed our Railway at its best. A day where the weather was quite fickle with most of the hours sunny, if cold, deteriorating into the present conditions of rain and hail. Nonetheless, the PWT continued their scrounging of serviceable components for the Shottle loop project. This involves quite a tedious recovery and replacement of good components for less good components reflecting our inability to fund fresh sources of this equipment. Credit is due to Mick Thomas for coordinating a labour and machine intensive but least cost solution. The Buffet Car enjoyed a steady trade though the day and our latest recruit bakes a fine scone for the genuine Derbyshire Cream Tea. John continues his snagging work to complete the refit project. The DTT were in action and have largely completed the Ladies which will open tomorrow. The Head of Gardening was present and muttering about dandelions but the area under her control looking most attractive whilst the sun shone. A report from the VCT after yesterday's communications problems confirmed that they had completed work between Idridgehay and Shottle, for the time being, and also between Postern Lodge and Hazelwood. They had a team of eight and burnt a great deal of brash. The Booking Hall achieved a new look as its mixed role as a purveyor of food and gifts draws to an end with a fix on quality souvenirs for our passengers taking precedence. The new range of mugs should please a number of our team as well as visitors. The Class 33 group should be well pleased!, as they say. A lot of behind the scenes preparation for tomorrow's HST excursion from St Pancras has been done and I just hope the rain holds off. Inevitably the sun came out today and shone down on a legion of activities. The PWT harvested materials from the former Gorsey Bank line and the Wirksworth Yard for the Shottle loop project and managed a track inspection between Idridgehay and Shottle. 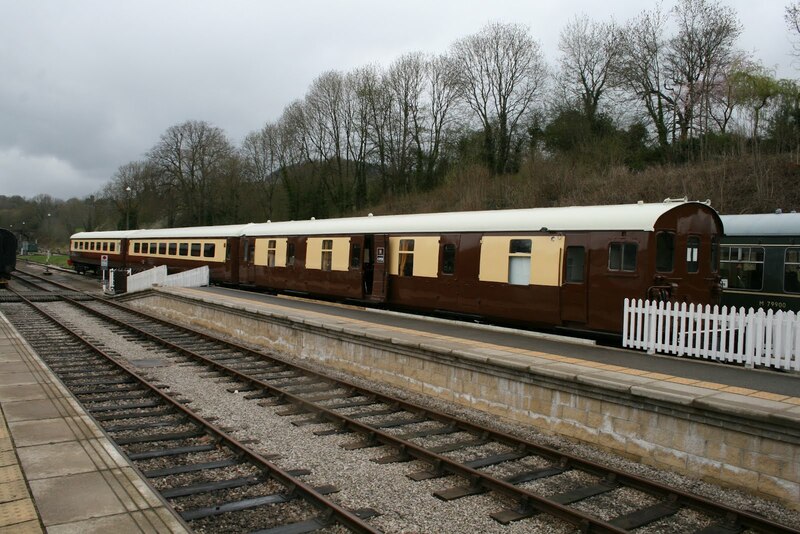 The DST concentrated on their energies on Henry Ellison and the LMSCA were happy with the progress on the flooring of the BTO and achieved the installation of the steam heating pipe underneath the coach. Dmus were moved so that the LCC could access them for cleaning ready for our next big day on Thursday. The VCT have been in action but mobile phone signal blank areas have prevented any knowledge of their activities - but I am sure they have been productive. Snagging work has continued on the Pullman Buffet Car which has continued to trade with some success. Fred & Iris gave the Booking Hall a thorough clean and the feature garden on Platform 1 has had the woodwork stained for the first time in many years. The DTT report that the concrete has been laid between the "plinth" and the building and that the Ladies is almost ready for commissioning all bar a little decoration. The Booking Hall gathered the financial strands together after the Easter weekend and completed the long task of AGM mailouts. The DST also report that they would welcome candidates for trainee firemen as steam commitments grow. Glossary - I am reminded that our acronyms are not always understood by all! A wet, chill and thoroughly miserable Bank Holiday Monday that saw little activity before lunch time but with a welcome lift in the afternoon. All team worked in appalling conditions but Richard Buckby who acted as Third Man on the Duffield service deserves particular praise for getting a soaking at each level crossing gate opening, 4 per round trip making 12 excursions in all. The other hero was Mary who continually had to rid her tent of pools of water whilst dispensing the egg hunt to an unexpected number of wet egg hunters. It was good to see Lorna in the EVRA shop and the narrow gauge team also endured the weather. The catering team had quite a good day where the warm food was a winner. All in all the whole team did amazingly well and deserve our thanks for keeping the show on the road. A little further progress with the Class 119 rounded off the day. feedback was received including from visitors from other railways. I thought I would share with you, in a blow by blow commentary, how we have moved on in our 10+ plus years of activity from the customers point of view. My son, wife and two children, one and two and half years old, descended on us of the Easter Weekend and some thought had been put into the time to ensure they were entertained. We commenced our day at Wirksworth station at around 1130 yesterday and the first port of call was Mary's egg hunt stall and armed with the location questionnaire we set off to respond to the 10 questions. The first few were polished off before taking the 1155 Wirksworth to Ravenstor and return which was followed by the children and their parents wanting food. Angela and team produced the adult all day breakfasts and sandwiches for the children, all well received and the back to the egg hunt. This took us to the Museum, C&HPR water tank and talking tunnel for a ride on the narrow gauge railway. During this trip the children could see No3 taking water and "pacing" us back to the steam loco shed. Coins were thrown into the waterfall together with "Poo sticks". A return to the remaining egg locations brought us to a journey to Duffield on the 1420 departure from Wirksworth. Ben was on trolley duty and the journey passed pleasantly as the children had fallen asleep and remained inert on the return journey. They woke up in time to enjoy a further visit to the Buffet Car before departing for home at around 1630. Everyone encountered had been pleasant and informative ensuring a good day out for those less than fascinated by railways. I write this as when we started this adventure we may have held peoples attention for 30 minutes to an hour and now we can claim to be a destination that will occupy the visitor of 5 or 6 hours with the ancillary support of other than pure railway things to do. Importantly for all of us the total spend was of the order of £70 compared with, maybe, £3 ten years ago. This will surely sustain our future if we continue to get it right. By way of contrast the same tribe visited Steeple Grange today with a similarly warm welcome and it was good to travel over the "Duke's" level crossing for the first time and experience their "branch" to the quarry en route to the National Stone Centre. The explanation of the fossils to be found there was quite fascinating, even to one who may be known for his cynicism! The SGLR have a lot going for them that is complimentary to our own operation and joint activities are to be encouraged. We have certainly come a long way thanks to all the people that made Saturday's experience rewarding for all those that experienced it. A rather grey and cold start to the day did not deter our visitors with good passenger numbers throughout the day. Rod and Mary's Easter egg hunt proved very popular with our younger visitors as did the narrow guage. The Pullman buffet is proving more popular by the day and the appetising smell of fried bacon was ever present on platform two. Down the yard a number of activities took place. The LMSCA were welding the floor on the LMS BTK. 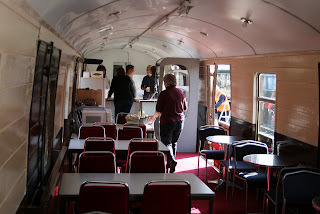 Work continued on the interior of the LMS breakvan. The DMU Team continued their work on the class 119 with steady progress on its interior and repaired a vacuum seal on the class 117. Maintenance work was also undertaken on the dogfish ballast wagons. The 8F group continued their work with the Henry Ellison boiler and the class 31 received some cosmetic surgery to its cab. Traditional Easter weather today with a chill to the air but we were spared rain. My thanks go out to everyone who participated in delivering our scheduled trains, the Booking Halls at either end of the line, the narrow gauge operation, opening of the Model Railway, the much appreciated on train trolley service and the well received catering products. It was all appreciated by today's passengers and a modest contribution to our finances has been achieved. The day demonstrated the value of a proving run on the Incline as the said run discovered a tree across the line. All departments responded to this emergency and we only lost one scheduled run to Ravenstor and again thanks are due to all that participated. The other slightly bizarre start to the day was the inability to get into our new splendid Booking Hall at Duffield as the combination lock had failed. Thanks are due to David N and Mick T for coming to the rescue. The positive side of the new arrangements at Duffield was a perfect balance of tickets sold with the cash taken which I can tell you is a significant step forward. The engineers progressed the woodwork within the interior of the Class 117 unit and undertaking mysterious, to me, technical things on the Class 33. Graham and Mick T took the opportunity of the majority of our oil axle box based wagon fleet being located at Wirksworth to give them an annual check up, top up the oil, drain any water and repair brake rigging damaged over the previous 12 months. There was a lot of housekeeping jobs undertaken at Wirksworth together with a little light gardening. The need to prepare our mail out of the Annual Accounts by stuffing envelopes and labelling them occupied any soul with nothing specific to do! Around 40% were dealt with today but if you do turn up over the next three days without a duty be prepared! My thanks to the willing today. The Derby & District Amateur Radio Society will be operating a Radio Station at Duffield tomorrow and Monday. They will be using the most appropriate call sign G2DJ to celebrate the first anniversary of the full line opening of our line. They hope to contact other Radio Stations around the world. After yesterday's white out today turned out to be pleasant and sunny at times allowing life to continue normally. The dmu team were thick on the ground preparing, washing and fuelling the fleet for the four days of Easter. They also achieved quite a landmark event by starting one engine on the Class 119 50173 that had last come to life in 1993, a remarkable achievement towards the final restoration of this vehicle. The Steam Experience clients were ably hosted by Mick and Hylton and expressed delight in their time with us with the afternoon session seeing a whole line tour. Before the Steam Experience got underway I asked Richard B and Tom T to conduct a complete line examination ahead of tomorrow's train service in view of the snow and high winds. This was successfully undertaken with no problems encountered. Richard then went on to progress the lonely job of collecting chairs for the Shottle loop project. Some finishing work on the Buffet counter was done but a fault on the water heater leaves us with unsatisfactory solutions over the Easter weekend. Nonetheless, the Pullman Buffet proved to be a winner today with trade building up from our volunteers and occasional visitors suggesting the seven day opening may be a winner for us. Anton undertook his pre-event signing programme at various sites along approach roads to Wirksworth and Richard P came in to top up the Multicar's weed treatment container ready for its next excursion. Significant progress by the DTT allowed the christening of the first new toilet and its opening in time for the upcoming weekend. It would be embarrassing to mention the first client but only to say he was a former resident of Barnsley. The Booking Hall continued valuable work processing group bookings and preparing Pullman Buffet Car menus. I also should mention yesterday's heroes that included the Pullman Buffet Car staff who amazingly served a family of four that had braved the appalling conditions and Leigh, in the Booking Hall. who continued working until he could reset the server and webcams. We also held meetings with a customer who is planning an event for salesmen and the Guerrilla Gardeners who are anxious to develop their activities at Wirksworth. Lastly, for those of you who haven't seen the complete Pullman line up a photo is attached showing their magnificence. We are sorry for the lack of webcam images today, the weather is causing mayhem with the electricity supply in Wirksworth town and our Internet connection is down as a result. Hopefully it will be rectified shortly. New photo attached that is actually current rather than history, if only recent! A massive shunt today with Chris, Matt, Eric and Robin coordinating the activity saw the First Open moved adjacent to the Second Open to unite our three newly liveried vehicles together. This was a task that involved a lot of stock shifting and included the clearance of the Car Park of the Dogfish and three, now empty, flat wagons. The end product really delivers the "wow" factor as people arrive on site to see a three coach Pullman train. 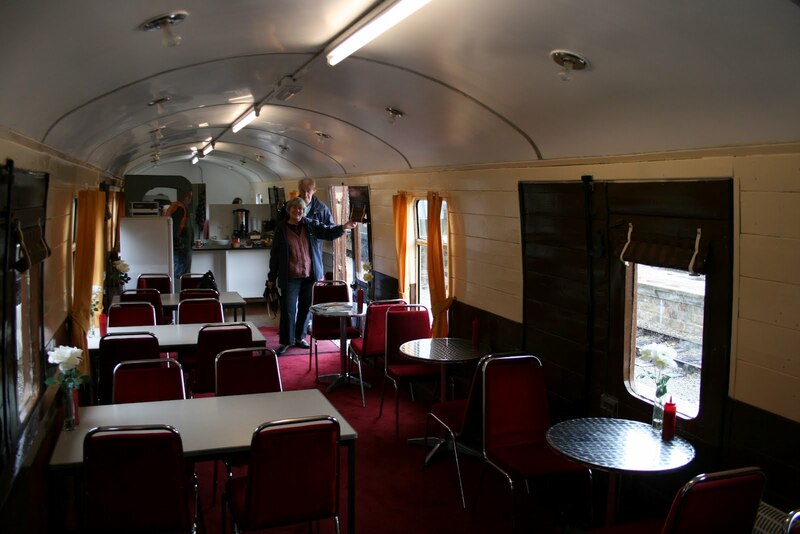 It was day two of our Pullman Buffet Car and there was a steady trade to sample the "all day breakfasts", bacon butties and freshly made sandwiches convincing me that this adventure will work. Our customer today demonstrating surveying equipment also was tempted by the pleasant smell emanating from the Buffet and consumed bacon and sausage sandwiches. A very well done to the new catering team who are working in a still incomplete premise whilst the fitter is poorly. The PWT completed the resleepering between Wirksworth and Idridgehay, or used up all we are going to buy in this financial year, and returned at a fairly early hour satisfied with their endeavours. The Pullman Buffet benefited from the attentions of the Cooke household and now boasts tasteful curtains and blinds. June has pursued a determined approach to our standards of presentation and I am extremely grateful for all her hard work ably supported by her family. Embarrassing picture attached. The DST concentrated on Henry Ellison as the boiler endured water pressure testing, caulking of the firebox and design work on the boiler clothing. The VCT report that they have reached "Willow Crossing" footpath on the approach to Shottle with so splendid four fire day, fence repairs and a strong team of seven people. Upon Allen's return there was a little debate about how many of the team enjoyed free TV licences. Quite a few were identified which says a lot for the health giving properties of working on vegetation clearance. We await the first telegram from the Queen that will be delivered by liveried messenger to a location only located by an ordnance survey reference. The Filing Fairy pursued her determined approach our record keeping submitting Stuart to the third degree today. The last event today was the arrival of a very large black tank funded by EVRA which has been placed on the Wash Green dock as part of the upgrading of our water supplies for steam locomotives. This is a most significant event and represents Vera's determination to raise our game in this area. The DTT carried on with their vital project by completing the cut out of the former telephone mast plinth and being ready for the laying of a concrete pathway in connection with the toilet task. The Booking Hall dealt with the weekly accountancy work and made strides in our determination to get the Duffield operation on a proper footing for 2012. This is in terms of properly accounting for our sales there and providing a new level of "customer" service. A cloudy and cool day at Wirksworth with several tasks completed. The bubble car had further repairs to its ceiling , 10 tons of type one stone was removed from the car park to the ballast dock to make concrete pads for the new water tank to sit on , all the the clay and ballast tippings from the railcare visit up the incline have been tidied and levelled off, a new post for the entrance barrier has been made and the new pullman buffet had its inaugural Monday opening today. Quite a lot of work for the 3 people on site. We hope to improve on the roll call presently. entertaining for our passengers, some of whom broke into song on the way. "That was absolutely charming - we will see you again soon..."
"What wonderful old posters you have on the front of the station..."
"Isn't this a sweet little waiting room..."
"We're from Croydon. You're really friendly here..."
"What lovely pansies you have at this railway.."
"Here's a donation. Ben gave us a really good show..."
Trumpet (A Marston's House), to rest my astonishment.